Last year SATO Corporation – a housing investment company in Finland – decided to take control over spend and purchasing behavior. Reducing cost but also ensuring possible supplier risk control and working capital optimization. A supplier base of 2 000 active suppliers were to be reduced by 50%, supplier invoices to be automated by 80% and maverick spend minimized. The solution meant aligning strategies, processes and technology and making sure management, employees and suppliers recognize the importance of set up processes. 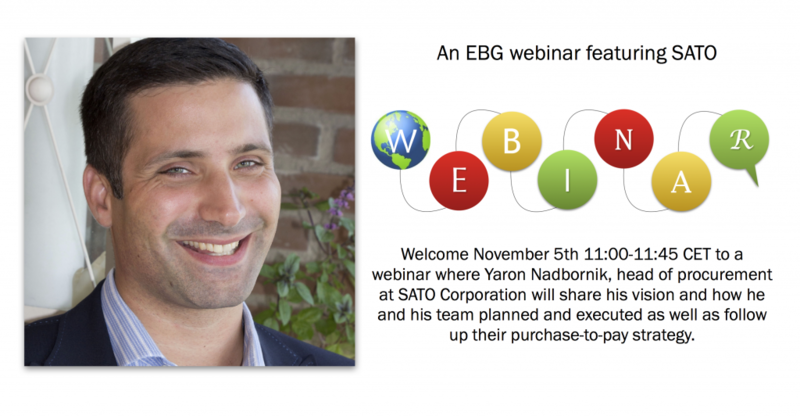 Welcome November 5th 11:00-11:45 CET to a webinar where Yaron Nadbornik, head of procurement at SATO Corporation will share his vision and how he and his team planned and executed as well as follow up their purchase-to-pay strategy. Together with Martin Casserdahl, Director, P2P Presales and Director, P2P Presales and Consultancy at OpusCapita you will get an up-to-date purchase-to-pay overview and action plan. • How do you enable purchase-to-pay control? • How can you ensure policy and process compliance? • What direct and indirect savings are calculated? • What KPIs are used making sure strategies are realized? A warm welcome to all practitioners wanting to benchmark purchase-to-pay efficiency and get inspired by Yaron Nadbornik. You will be able to compare your experiences live with peers and ask your questions, why not gather the team?